And they’re off! The 14th Annual Save the Manatee 5K Run was held on May 20th at the Lake St. Clair Metropark in Harrison Township, Michigan. A Virtual Race also allowed runners across the U.S. and around the world to participate. 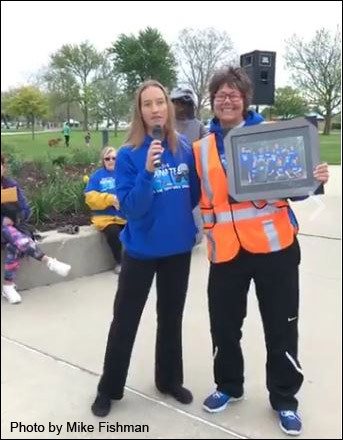 It was a little cold and windy, but other than that a beautiful morning in mid-May again and time for the 14th Annual Save the Manatee 5K Run, 2 Mile Walk and Mini-Manatee-Mile at Lake St. Clair Metropark in Harrison Township, Michigan. Almost 1,200 men, women, children and their canine pals came out to participate. 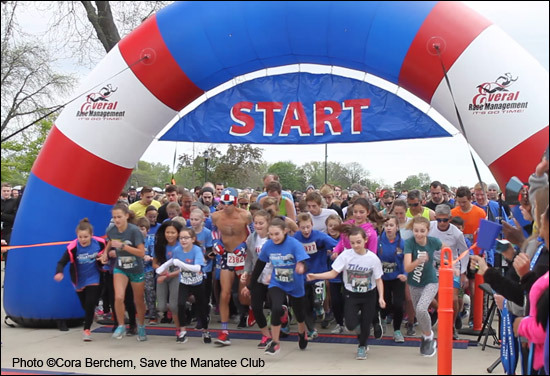 The popular race, hosted each year by L’Anse Creuse High School biology teacher, Lesley Argiri and her husband Brian McDonald, helps raise funds for Save the Manatee Club’s numerous conservation efforts. The race has raised over $175,000 since its start in 2003! This year, Lesley and Brian were able to raise an incredible $30,000 — an amazing effort on the manatees’ behalf, especially considering that they do it all out of their own house on volunteer time. All race participants received a unique race T-shirt and beautiful finisher medals, including medals for the pooches. Just like over the past years, Save the Manatee Club had an Adopt-a-Manatee and education table at the race and signed up an incredible 67 new members! Each person who adopted a manatee at the $35 level automatically received a free race registration for next year. (l-r) Save the Manatee Club’s Cora Berchem presents an award to Race Director Lesley Argiri for her continued efforts to help protect manatees. Cora Berchem, SMC’s Multimedia Specialist, represented the Club at the race once again. “Manatees have recently been downlisted from ‘endangered’ to ‘threatened,’” she said. “But that doesn’t mean manatees are out of the woods. Although their numbers have increased, so have threats and 2016 was the deadliest year on record for watercraft mortalities. Seeing so many people come together at this event to support manatees is heart-warming.” Once again, Joel Darling and his wife Jennifer from the Darling Cetacean society partnered with Save the Manatee Club on a manatee game where players needed to match manatees based on their scar patterns. “People love this race, because it’s quirky. There are no manatees in Michigan, but we have a lot of manatee lovers in Michigan,” says Race Director Lesley Argiri. “We love how many people participate to raise awareness for manatees. This year, YouTube bloggers Justin Charge and Lord Deezus came out to include the race in their comedy show The Following Announcement.” You can watch the beginning of the 5K Run on YouTube. To register early for next year’s race on May 19, 2018, email Lesley Argiri at largiri1@hotmail.com.